HELLO! HOW ARE YOU (WHEREVER YOU ARE)? ALSO (FOR THE FOLKS AT HOME THAT DIDN'T DO THEIR PRE- Q&A HOMEWORK)... WHO ARE YOU & WHAT DO YOU DO? I am Andrew Collins of the Andrew Collins Trio. I play mandolin, fiddle, mandocello, mandola, guitar and vocals. 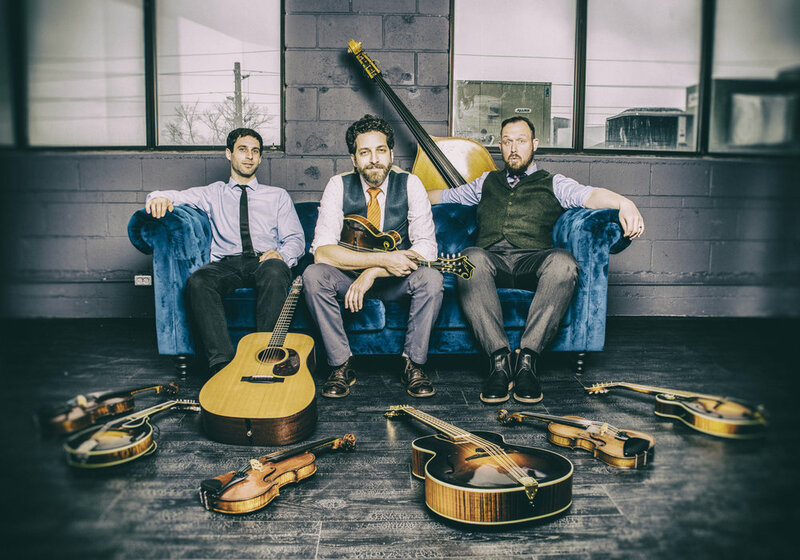 I’m joined by Mike Mezzatesta (guitar, mandolin, fiddle) and James McEleney (bass & vocals). 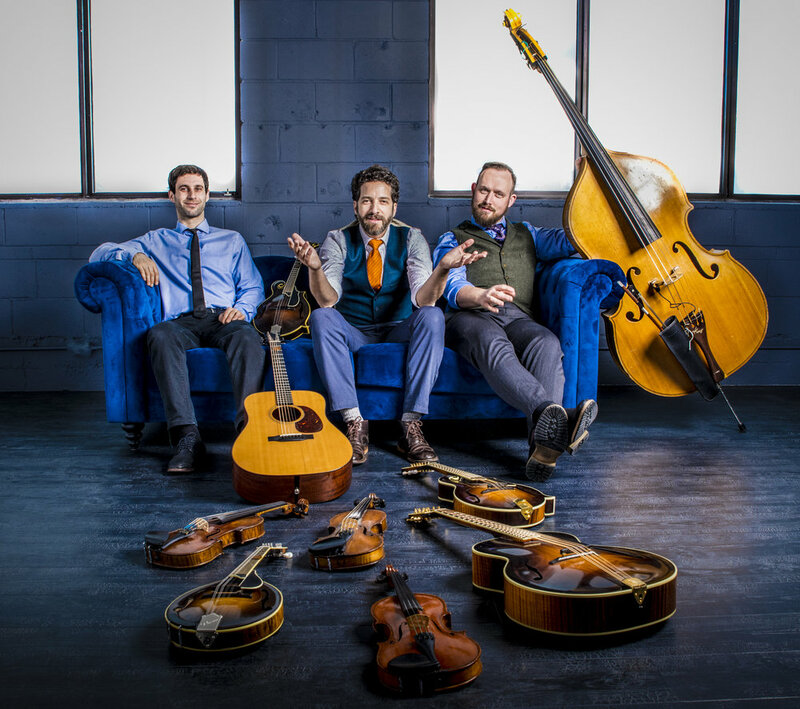 We split our time between original instrumental music and vocal music that draw from bluegrass, jazz, classical, celtic and whatever else is in the kitchen sink. FOR REASONS UNKNOWN (OK, MAYBE THE REASONS ARE OUR OUT-OF-THE-WAY LOCATION & SMALLER POPULATION), THESE NECK OF THE WOODS DON'T ALWAYS END UP ON EVERYBODY'S TOUR POSTER. SO HOW DID WE GET SO LUCKY TO END UP ON YOUR ITINERARY? Well, I would say we are the lucky ones, but let’s put it this way, this isn’t the first out of the way location/smaller population that we’ve played. In fact, you’ve just described 99% of Canada. But I can tell you that we’re absolutely thrilled to be coming. IF YOU COULD ONLY USE 5 WORDS TO DESCRIBE An Andrew Collins Trio SHOW (AND FOR THE SAKE OF THIS QUESTION, LET'S ASSUME YOU CAN ONLY USE 5 WORDS) WHAT WOULD THOSE WORDS BE? ACTUALLY, SINCE IT'S THE INTERNET AND WE CAN EMBED THINGS, HOW ABOUT YOU SHARE THREE OF YOUR FAVOURITE SONGS TO PERFORM AND THAT WILL GIVE FOLKS A MORE TANGIBLE IDEA OF THE KIND OF MUSICAL GOODNESS THAT AWAITS THEM AT YOUR SHOW? ‘Sunlight at Midnight’ is an original composition that features some tight instrumentation and improvisation. ‘I Drink Whisky (My Gal Drinks Wine)’ is a fun honky tonk/swing number written by my good friend Tom Parker. ‘Cello Song’ is one by one of my favourite singer/songwriters Nick Drake. This one features the mandocello, octave-violin and bowed bass. OK, NOW THAT WE'VE ALL GOT A DECENT IDEA OF WHAT TO EXPECT ON STAGE... WHAT ARE SOME OF THE THINGS YOU LIKE TO DO WHEN YOU'RE NOT MAKING MUSIC? I love spending time with my family (4.5 year old daughter & wife), I love practicing music and I love producing/recording music. Did I mention that I also love to play music with my daughter? AND—EVEN THOUGH WE'VE ONLY KNOWN EACH OTHER FOR 6 QUESTIONS—WHAT'S SOMETHING ABOUT YOU THAT WOULD TOTALLY SURPRISE US? I’m an avid pool player. I especially love to play 9 ball. I used to have a table in my studio and practiced hours every day, but I started running out of hours. FINALLY... PLEASE LEAVE US ALL WITH YOUR BEST PIECE OF LIFE ADVICE THAT YOU THINK EVERYONE SHOULD START DOING / USING / WATCHING / LISTENING / EATING / THINKING / QUITTING / READING / ETC-ING TO MAYBE MAKE THEIR LIFE A LITTLE BIT BETTER AND/OR BEARABLE. “Keep your pills in one pocket and your change in another, because I just took my last 25 cents.” Words of advice from my hero Roger Miller. Alright, that's all the Q's and A's for this Q&A. Before you head off to some other corner of the internet, make sure to follow Andrew Collins Trio on Facebook + Instagram and jump over to their website to do an even deeper dive on the music… and if you're reading this before November 15th 2018, try to make it to their concert at Royal Alexandra Hall in Cranbrook (tickets available thru Key City Theatre)!